These Yeast Rolls are the perfect fluffy pull-apart dinner rolls for weeknights and holidays. So tender, buttery, and delicious, just like grandma used to make! Soft, chewy, doughy bread — what could be better? 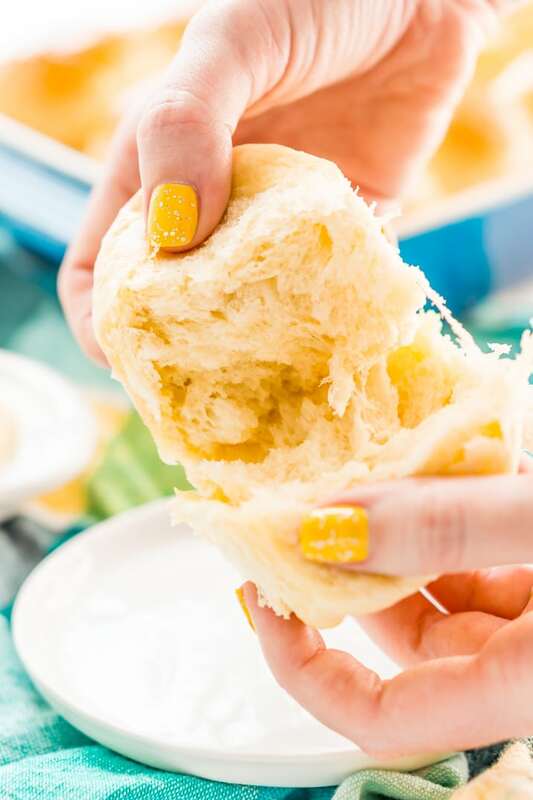 If you can’t help but agree, this easy seven-ingredient recipe for homemade Yeast Rolls will be your family’s new favorite dinnertime staple. These fluffy, buttery rolls are the perfect accompaniment to steak, ham, chicken… just about anything! If dinner doesn’t seem complete without a side of steaming bread, this recipe is definitely one you’ll use again and again. These yummy Yeast Rolls are brushed with butter and come out of the oven golden brown on the outside, light and airy on the inside. This side can be shared like pull-apart bread, and it’s tasty enough for special occasions but easy enough to make on any weeknight! Yeast Rolls do take a little planning because the dough needs to rise, but there’s a lot of “hands-off” time involved in making them. After the ingredients are mixed, the dough needs to sit for about an hour until it doubles in size. With that said, these rolls only take about 10 minutes to bake. The short cooking time means that it’s easy to serve Yeast Rolls hot and fresh from the oven, which is when they taste the best! Both St Patrick’s Day and Easter are around the corner, and you may have plans to celebrate these holidays with a big, traditional meal. Yeast Rolls are delicious with a feast full of corned beef, cabbage, and mashed potatoes, and they’re just as tasty with a slab of honey glazed ham and all the fixings. I love using day-old Yeast Rolls to make sliders or sandwiches for lunch the next day. As a matter of fact, I’m already dreaming about making mini Reubens and ham sandwiches with all my Saint Patrick’s Day and Easter dinner leftovers! Whenever I have guests over — or I’m bringing a dish to someone else’s house — I try to keep the food as homemade as possible. 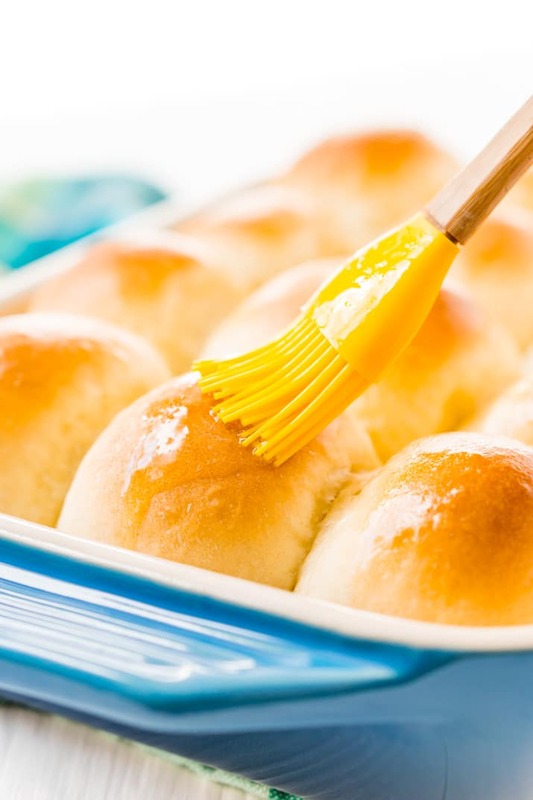 There’s no need to buy dinner rolls with this simple recipe because the irresistible taste and pull-apart texture of Yeast Rolls make them a total crowd pleaser. Plus, everyone will be impressed that you made your own bread. 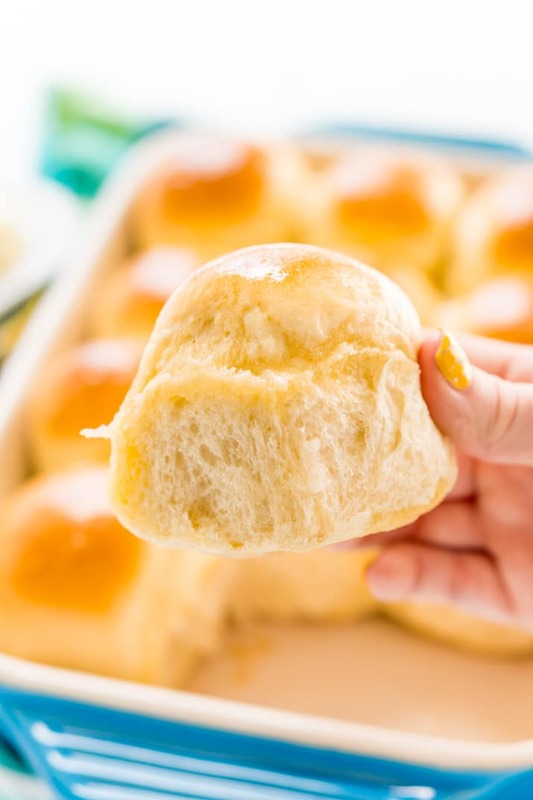 Whether you need bread to add to a holiday spread or just something to round out your weeknight dinners, Yeast Rolls are an easy, delicious way to complete a meal and please the whole family! How Do You Make Yeast Rolls? 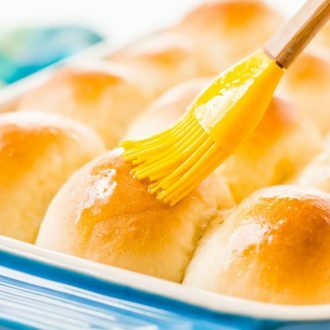 These delicious dinner rolls aren’t hard to make, but they do take a bit of inactive time to proof, this leaves you free to work on other components of your main meal or go watch TV! 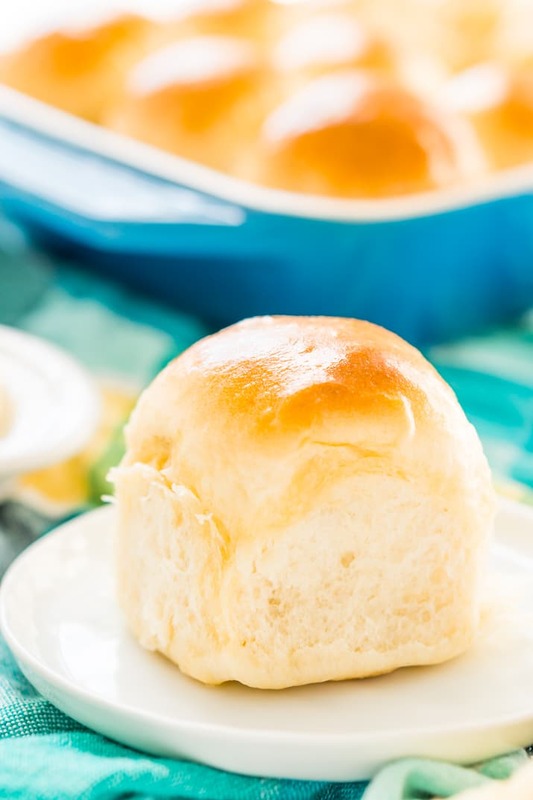 This recipe uses dry active yeast, so you need to let the dough rise for perfectly fluffy rolls! Begin by dissolving the yeast in the warm water in a very large bowl. Stir in the sugar and let stand for 5 minutes. Next, stir in the egg, melted butter, salt, and as much of the flour as you can with a wooden spoon. Then you’ll transfer the dough to a stand mixer fitted with a dough hook and mix on low speed for 6 to 8 minutes. Alternatively: You can turn the dough out onto a lightly floured surface and knead by hand until the dough is smooth and elastic. Shape the dough into a ball and place back in the large bowl, making sure to lightly grease the bowl first, then turning one to cover the surface of the dough with grease. Cover with a clean hand towel and let rise in a warm place until the dough doubles in size, about 45 to 60 minutes. See tips for helping dough rise below! Next, you’ll need to punch the dough down and turn out onto a lightly floured surface, divide the dough in half and cover the dough back up with the cloth and let rest for 10 more minutes. Meanwhile, lightly grease two 9×13-inch pans. For Larger Rolls: Use a 15×10-inch pan and do not divide the dough. Then, you’ll need to divide each half of the dough into 12 pieces and shape the rolls by gently pulling each dough piece into a ball, tucking the edges under and arranging on the baking sheets. If you are making larger rolls, make 15 equally sized balls of dough. Cover the pans of rolls with hand towels and let rise in a warm place until the rolls have doubled in size, about 30 minutes. 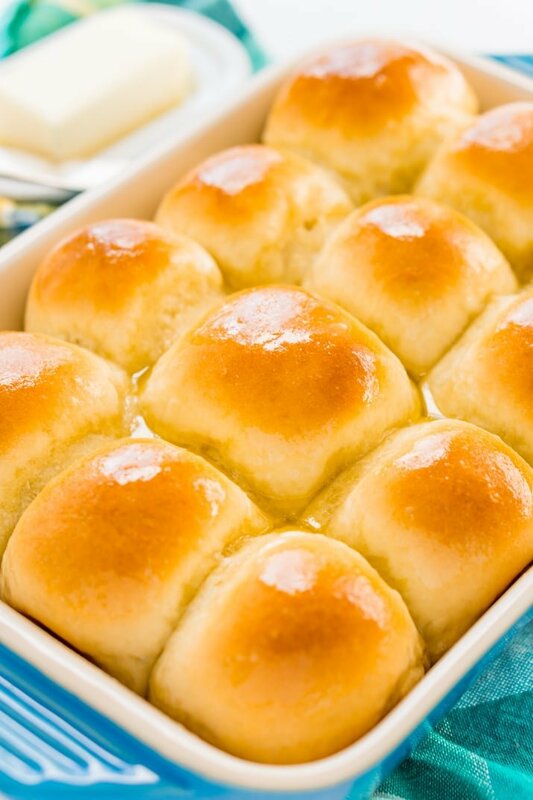 Preheat the oven to 350 degrees F and brush the tops of the rolls with melted butter. Bake for 15 to 18 minutes or until the tops are golden brown. Brush the rolls with more butter after removing from the oven. Best served within 24 hours. 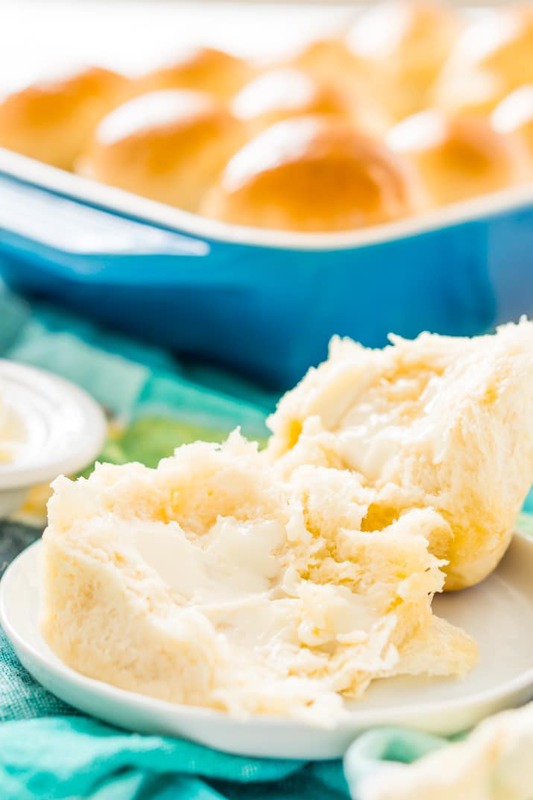 Pin this Dinner Roll Recipe for Later! Getting dough to rise can, at times, be tricky especially if your kitchen tends to be on the cooler side. Baking bread has been and artform for centuries, but up until the last one, many depended on wood stoves for cooking and warmth. This meant kitchens were usually pretty toasty and you didn’t really have to worry about your dough not rising, but things are different now with central air and radiant heat, fewer and fewer homes use woodstoves and it can be a little harder to get dough to rise properly, so here are some tips for doing so! You will need to make sure your oven is cold for this one, so not a great option for when you have a ton of things to cook on big holidays like Easter or Thanksgiving. Place a piece of greased cling wrap over the top of your large bowl of dough and place on the top shelf of the oven. On the bottom shelf, place a bowl or pot of boiling water. The water will help warm the oven and make for a great dough-rising atmoshphere. Preheat your oven on the lowest temperature for 2 minutes then shut your oven off. You will need to put your bread in an oven safe bowl and let the dough double in size. Not that dough may take less time to rise with this method so it’s good to check on it every 15 minutes or so. Dissolve the yeast in the warm water in a very large bowl, then stir in the sugar and let stand for 5 minutes. Stir in the egg, melted butter, and salt. Stir in as much of the flour as you can with a wooden spoon. Transfer the dough to a stand mixer fitted with a dough hook and mix on low speed for 6 to 8 minutes. Alternatively: You can turn the dough out onto a lightly floured surface and knead by hand until the dough is smooth and elastic. Shape the dough into a ball and place back in the lightly greased large bowl, turning one to cover the surface of the dough with grease. Cover with a clean hand towel and let rise in a warm place until the dough doubles in size, about 45 to 60 minutes. Punch the dough down and turn out onto a lightly floured surface, divide the dough in half and cover the dough back up with the cloth and let rest for 10 more minutes. Meanwhile, lightly grease two 9x13-inch pans. For Larger Rolls: Use a 15x10-inch pan and do not divide the dough. Divide each half of the dough into 12 pieces and shape the rolls by gently pulling each dough piece into a ball, tucking the edges under and arranging on the baking sheets. If you are making larger rolls, make 15 equally sized balls of dough. What beautiful rolls! These would be so great for a holiday bread basket, and the texture looks perfect. Love those glossy tops, and the suggestion to use them for holiday leftover sandwiches, too! Thanks, Amanda! And yes, so many great uses for them! WOW! These rolls are absolutely perfect. So fluffy and delicious. They will be on the Easter menu for sure. Totally off topic of food, but your nails <3 I love yellow and I'm seriously obsessed with that color you have! 🙂 It's the perfect yellow!! Thank you! It’s CND brand in Bicycle Yellow 🙂 With a glitter top coat!